A quick and simple origami birthday card project! Who doesn’t love cupcakes? This origami cupcake birthday card is the perfect way to send good wishes to birthday boys and birthday girls of all ages! This project is easy enough for a child to complete with minimal adult assistance, so it’s the perfect project if your son or daughter has been invited to a friend's birthday party and you need a last-minute greeting card. For this easy origami model, you’ll need one sheet of square origami paper that is 6 inches by 6 inches square. Your paper needs to be colored on one side and white on the other side. The colored side becomes your cupcake liner and the white side becomes the cupcake frosting. Free printable origami paper designs would be appropriate, if you find a pattern that you like. Additionally, you will need one sheet of 8 1/2 inch by 11 inch paper for your card base and one sheet of 12 inch by 12 inch square scrapbooking paper to create an envelope for your card. These larger papers should coordinate with the color you’ve selected for your origami cupcake. Begin with the white side of your paper face up. Fold your paper in half along one of the diagonals to make a large triangle. Fold the top point of the top layer of paper down as shown in the photo. This fold should be about 1/2 inch from the bottom horizontal edge of the paper. Make accordion folds by folding the bottom point of the triangle up and then down as shown in the photo. This creates the edge of the frosting on your finished cupcake. Flip your paper over. Fold the top layer of the paper down to make a small triangle. Fold the left and right sides in towards the center crease as shown. This forms the angled part of your cupcake liner. Flip your paper over once more, so you’re back to the original starting position. Bring the tip of the triangle created in the previous step over the top of your paper to create a gumball topping for your frosted cupcake. Fold a sheet of 8 1/2 by 11 inch paper into fourths to create a base for your card. 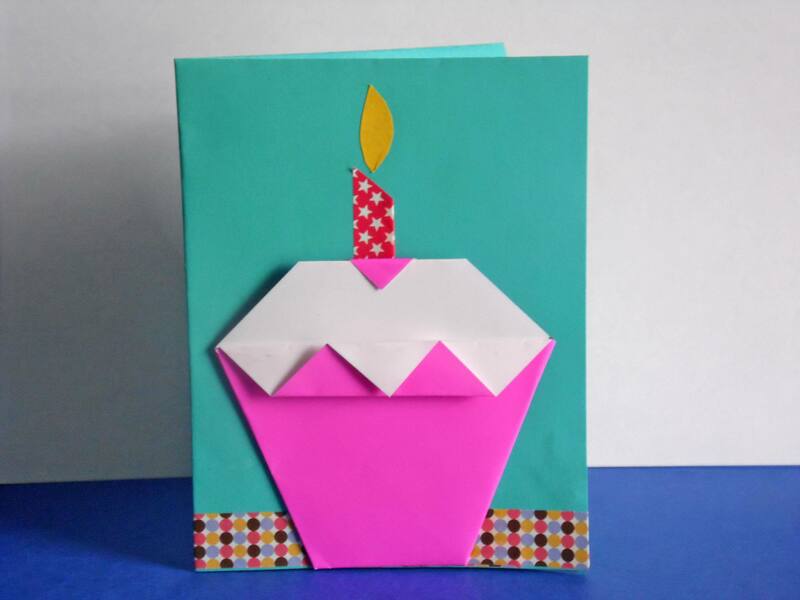 Attach the origami cupcake to your card with a glue stick or some adhesive squares. If desired, use colored washi tape to create a birthday candle and table base for your card design. You could also use fine tipped markers to go over the fold lines created in Step 5 and add colorful sprinkles to the white cupcake frosting. To add a feminine touch to the card, consider embellishing with a bit of glitter glue or small self adhesive rhinestones used as cupcake sprinkles. Add the desired saying to the inside of your card using letter stickers, stencils, or scrapbooking rub-on letters. If you’re having trouble coming up with a suitable sentiment, check this out if you need some great birthday card sayings.